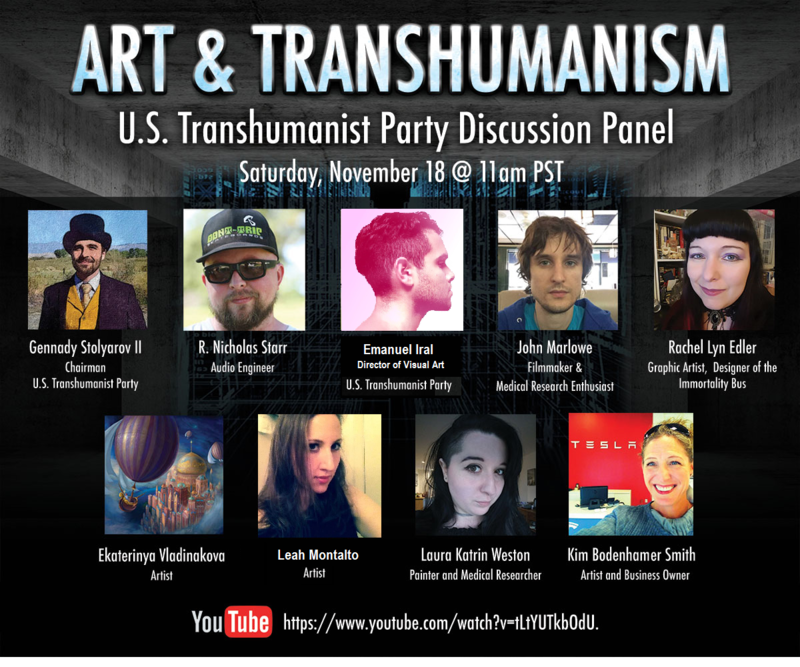 On November 18, 2017, the U.S. Transhumanist Party invited leading artists in a variety of media and styles to a two-hour discussion, moderated by Chairman Gennady Stolyarov II and Director of Visual Art Emanuel Iral, on the subject of Art and Transhumanism, delving into how and which works of art can help inspire humans to pursue the next era of our civilization – through promoting the advancement of science and technology, rationality, and/or a more hopeful vision of the future. The panel also explored various interactions between art and technology and ways in which art can improve human connection and understanding, while also comprising the very improved functionality that emerging technologies provide. Emanuel Iral is Director of Visual Art for the U.S. Transhumanist Party. Emanuel’s artwork ranges from traditional paint and pencil work to 3D digital work. Currently he is working on his VFX and animation skills, as he is producing short films for his music. He encompasses his art under the term Prismatis – Latin for prism. A prism refracts white light into the three primary colors: yellow, magenta, and cyan. Prismatis is all about the aesthetic of human expression, which can be separated into the art, audience, and artist. RachelLyn Edler is an accomplished graphic designer with over 20 years of creative experience. Rachel comes from a diverse background of product development, packaging and web design. In her free time she volunteers for several scientific and secular organizations including the Planetary Society, Richard Dawkins Foundation for Reason & Science and the Secular Coalition for America. John Marlowe was educated in film theory and trained in film production at UC Berkeley. His outlook on film as a vehicle for social messaging has been largely influenced by his lifelong struggle with a genetic inborn error of metabolism, a type of disease that – until recently – was beyond the scope of medicine. Consequently, John feels it is his onus to emphasize the artist’s responsibility in shaping the conversation regarding medical research, to create a society more amenable to scientific progress, rather than one fearful of change. Leah Montalto is a painter based in New York City and has maintained a successfully operating painting studio in New York for the past 12 years. Her paintings have been exhibited at the National Academy Museum of Fine Art in New York, and have been reviewed in the New York Times and the Providence Journal. Leah’s paintings have received awards including the National Academy Museum of Fine Art’s Hallgarten Prize in Painting and the NYC Cultural Commission arts grant. Leah is a former professor at Sarah Lawrence College, and has an MFA in Painting from Rhode Island School of Design. Leah is not affiliated with the Transhumanist Party, but her paintings explore related themes. Kim Bodenhamer Smith is a single mother of two boys living in Chattanooga, TN. She is a founding member of Southside Abbey, a Lay Missioner in The Episcopal Church, and an Outdoor Wear Business owner of Chilliheads. She is a caver, unicycler, and an aviation enthusiast and creator of #helichurch. She has a BFA in Metals and also studied Graphic Design and Political Science. *She also has many Tesla Tales to tell and is a Social Media Manipulator (different from a troll)! R. Nicholas Starr is an audio engineer and multimedia artist whose work focuses on Earth’s dystopias of past, present, and future. Also a biohacker, researcher, and theorist, he immerses himself in the subjects surrounding these worlds and has published several non-fiction articles and interviews. With an education in electronic signals intelligence from the United States Air Force, and 15 years of digital art and audio production in the US and abroad, he has become a unique voice for science fiction, the U.S. Transhumanist Movement, and American policy. Ekaterinya Vladinakova is an accomplished digital painter and professional freelance illustrator. Vladinakova specializes in fantasy and science fiction work, but is also interested in editorial illustration. Vladinakova spends most of the day painting in Photoshop, creating scenes related to fantasy, or science fiction, as well as brushing up older works. Vladinakova’s paintings have been featured by the U.S. Transhumanist Party – including the “City of New Antideath” – a vision of the future which was commissioned for Mr. Stolyarov’s 30th Birthday. Dr Laura Katrin Weston is from England and studied Fine Art before going on to studying Medicine. She is a trained pathologist with a specialism in medical biochemistry and inflammation-related disease. She has used her medical knowledge and professional painting career to support Lifespan.io – one of the biggest life-extension research and advocacy charities. Laura is also vocalist for symphonic metal band Cyclocosmia – a music act that will be trying to raise awareness of transhumanist and human mortality issues in their next upcoming album.